Chinese New Year is around the corner and for many of us, the baking and making of Chinese New Year cookies and other delectable goodies has started. It is barely a month from all that Christmas cooking and feasting, and just when we thought that we could rest our ovens and stomachs for a while longer, it is time to get busy again! But this is no surprise as once Tang Chek is past, traditional households look forward to the coming of “Chun” (spring) and of course Chinese New Year celebrations. Time to take out all those kueh moulds which had been kept away over the last year and for some, even longer. Wooden moulds to tekan kueh koya and cutters and crimplers for kueh bangket (kuih bangkit), aluminium or steel clam-shell moulds for kueh belanda (kuih kapit) and of course the heavy brass ones for kueh baulu (kueh bolu or kuih bahulu). Let’s not forget the tortoise-shaped wooden moulds for making kueh koo (angku kueh) for sembayang tikong on the birthday of the Jade Emperor which falls on the 9th day of the Lunar New Year as well! Many peranakan households still have old moulds which have been handed down over the generations, used by the bibiks of the past to whip up all those popular snacks which are enjoyed over the festivities. 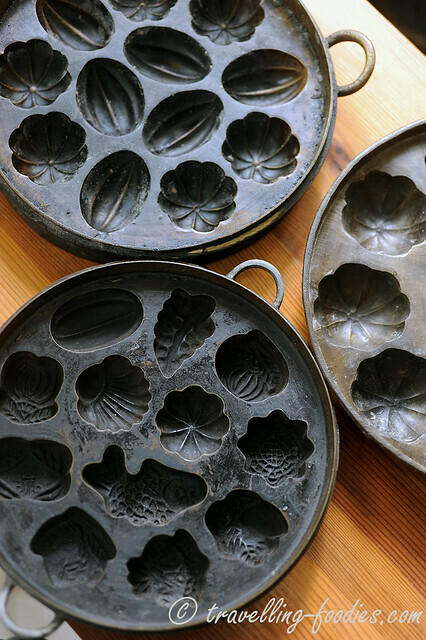 My personal favorites are the kueh baulu moulds incidentally, so its a good time to take them out for a good scrub amidst all that spring cleaning to be done! 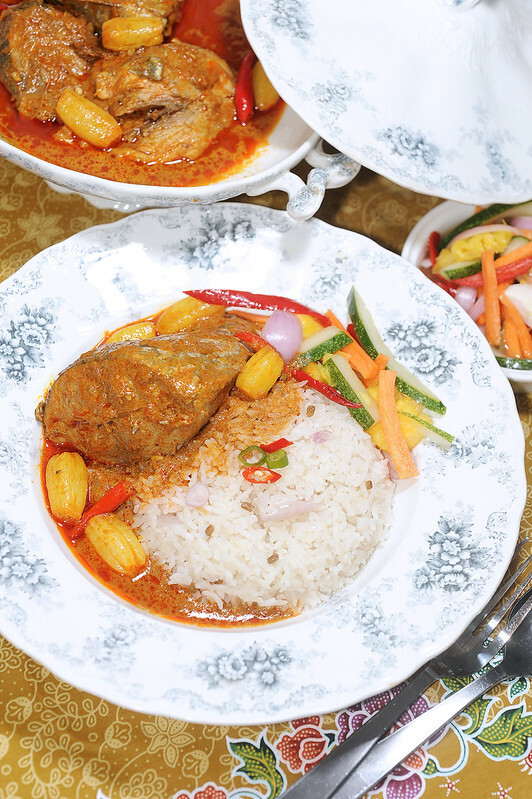 Nasi Dagang, i.e. Trader’s Rice is a very common breakfast fanfare enjoyed by the masses along the eastern coast of the Malay Peninsula, especially in the states of Kelantan and Terengganu. It uses a mixture of white rice (beras wangi) which is first soaked and subsequently steamed with glutinous rice (pulut) with coconut milk added for its wonderful aroma and flavour. This likens another popular breakfast dish, Nasi Lemak over here in Singapore. However, instead of pandan leaves, sliced shallots (bawang merah) and fenugreek (halba) are added. 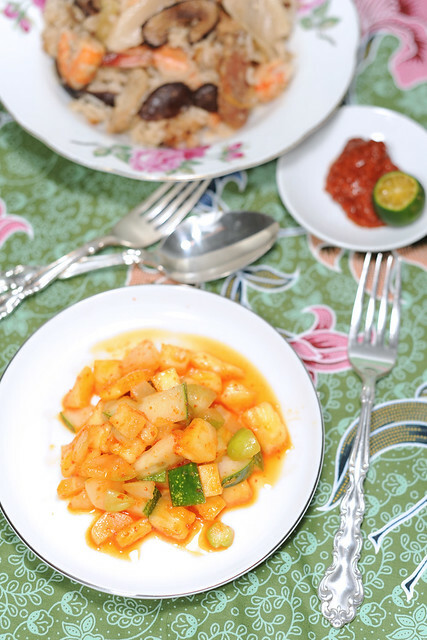 This concoction seems to be the preferred combination for many dishes, as we’d seen in Pulut Lepa and Ketupat Sotong. As we have seen in several dishes from Terengganu, fish is a staple amongst the folks from this region, and Nasi Dagang is no exception. It is eaten with Gulai Ikan Tongkol, a spicy fish red curry cooked with tuna and a hoard of spices as well as buah belimbing, one of my favorite ingredients I love to use in Straits cooking. And this month’s Malaysian Food Fest seem like a timely affair to visit and pay tribute to this time-honoured dish. When I first started learning to cook nonya dishes, I remember being immediately overwhelmed by the sheer complexity of some recipes. Tedious steps to follow, long and painstaking preparation, tiring rempah pounding, long list of ingredients to garner… are just some of the reasons which deterred many from trying to cook the dishes for themselves. Yes, peranakan cooking can be very patience-testing, obviously one of the many virtues I lack. But the results are often very rewarding, as its through these multi-step culinary “ordeals” that all those intricate nuances of flavours and textures were teased out, to which is what many of us enjoy about peranakan cooking. Having said that, not all peranakan dishes are difficult to cook or troublesome to put together. Kerabu Belimbing Timum Nanas is one such recipe which is almost effortless to prepare and requires very little time to do so. It is served as a “palate refreshener”, marking contrast against the other robust and full-bodied flavour dishes, to make the latter lighter for the stomach, so that the whole meal would not be just about heft. Being spicy and tart at the same time, it is perfect “conditoner” to whet everyone’s appetites!